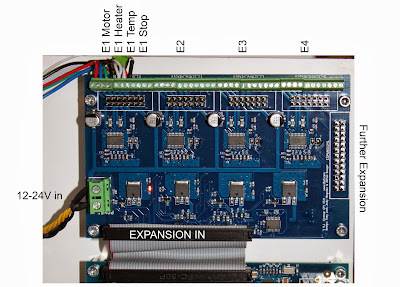 An additional expansion board offers a further 4 stepper motor controllers to allow for a total of 5 extruders or up to 8 axis drives. On the main board are 4 Allegro A4982 stepper drivers (X,Y,Z,E0), 3 FETs (Heated Bed, E0, Fan), 2 Thermistor inputs (Heated Bed, E0), 4 Endstop channels (X, Y, Z, E). The stepper drive current is electronically controlled with an I2C Digital potentiometer. As an alternative to using screw terminals there are double rows of pin headers for two wiring looms, 1 for the heated bed and one for the rest of the printer. This allows for the easy use of wiring looms to simplify printer assembly. The USB port is a Hi-Speed A/B type allowing for standard for USB control from a PC and potentially support for USB devices in the future. The SD card socket is fully SD 2.0 compliant, supporting faster access and cards up to 32 GB. A 10/100T Ethernet port allows for network control via an on-board web server. Power in comprises a 12-24V main input along with connections to control a standard ATX power supply. 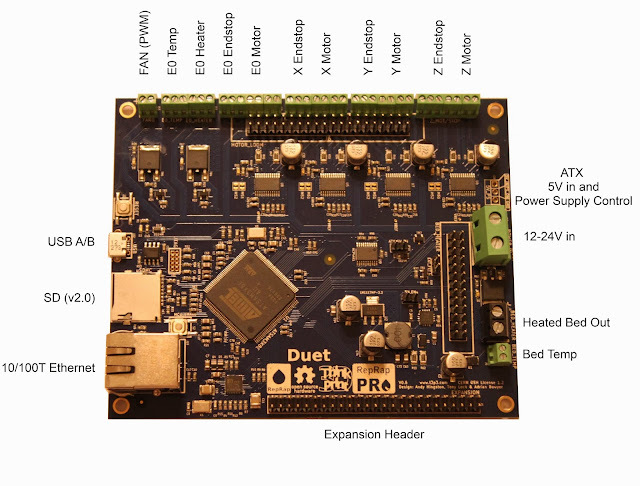 On board the Duet can use USB for 5V, incoming 5V from the ATX power supply and it has an inbuilt 2A switching power supply to provide 5V to support future expansion (for example powering a connected USB device). 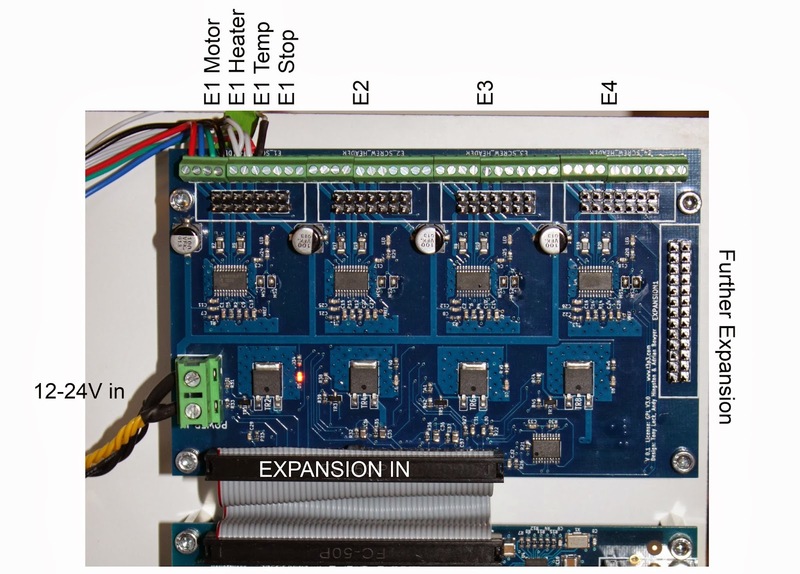 The expansion board has a further 4 A4982 stepper drivers (E1, E2, E3, E4), another I2C digipot, 4 FETs (E1, E2, E3, E4) and corresponding thermistor inputs. It also has a header exposing 3 Serial channels, SPI bus and 2x I2C buses for further expansion. The Duet hardware design is licensed under the CERN OHW License 1.2: the design is free to be distributed and modified within the terms of this license. All the design files are here on Github. 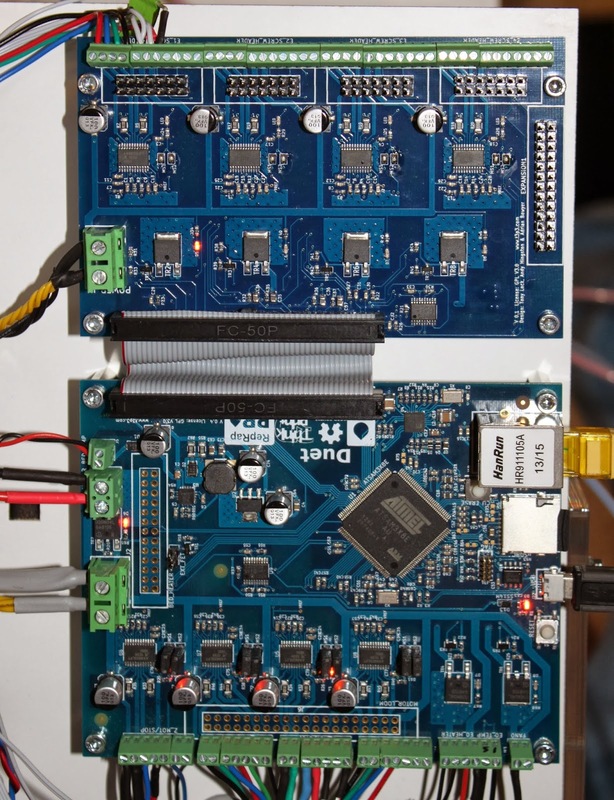 Not only is it Open Hardware but it was completely designed using the Open Source software package KiCAD so hacking and building on this design its accessible to all. A detailed blog post on the hardware design will follow. The Duet runs RepRap Firmware, a new C++ firmware by Adrian Bowyer. The firmware can be compiled with the Arduino IDE (tested with 1.5.4) or Eclipse and uploaded like other firmware, but the aim is for much of the printer specific information to be set by Gcode which is read on machine start from the SD card. Over the USB serial port (as current 3D printer controllers do) - making it compatible with software such as Pronterface and Repetier host. From the SD card, which also stores the web server files and the config files. 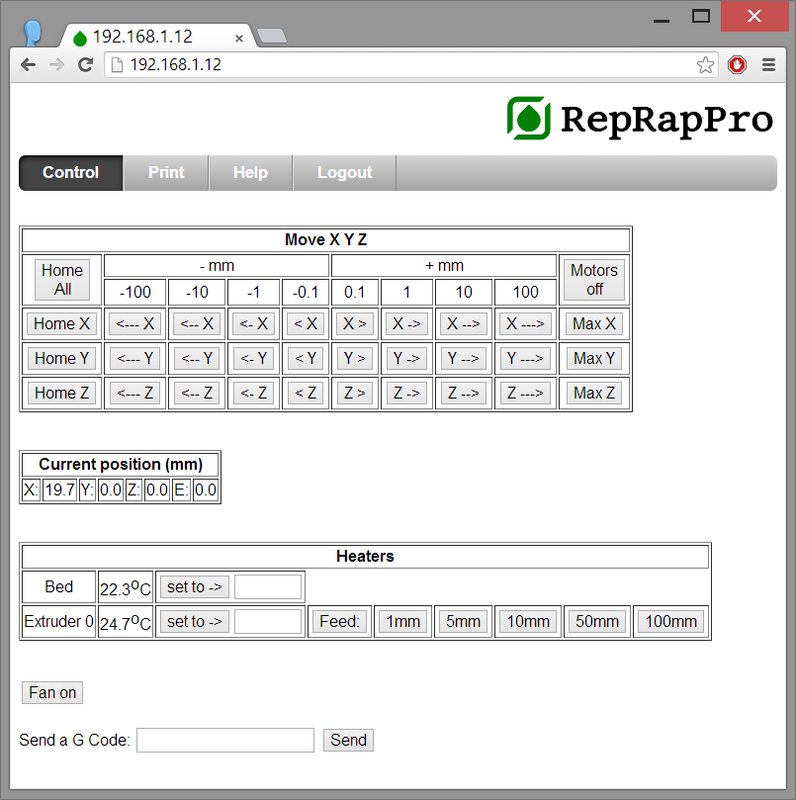 RepRapPro have a video here showing the web interface in use with the Ormerod printer. The software is adding new features daily, the most recent being added alpha level support for multiple extruder printing - see the T3P3 github, RepRapFirmware, multi extruder branch. Here is a picture of the first dual extruder print from a Duet and expansion board combo. I will add a video when I have a chance to edit it! 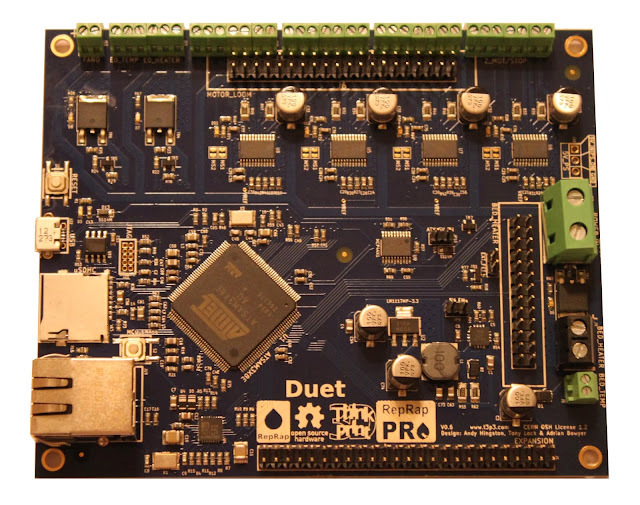 We will stock our Web Shop tomorrow with a limited number of the first Duet production run available for immediate purchase, with expansion boards to follow next week. A larger production run is underway so don't despair if you miss the first batch. Update: The Duex4 Expansion boards are available on our Web Shop. The source files for the board are on Github. Has the firmware delta support? My fork of the firmware does now, it's at https://github.com/dc42/RepRapFirmware/tree/dev. David your work is excellent. I want to develope a firmware with polar suport. I have knowledge with electronics, with arduino, C language and 3d printers... But I don't know how to start. Can you help me? Just I want to know where I can start and what steps i need to do to develope something like that. Potentially make a new gcode folder for a polar printer in the SD card folder. And then mess with some of the JS for the website part of it. i had stopped the coding project, looking for mechanical components, but i will back on it again. Cool board! will post over at OpenBuilds I am sure the guys will want to know about this one. awesome board from my experience, would love to see some CNC control firmware i could throw at it as the ethernet port and web interface make this soo user friendly. You can control some CNC machines from it (Laser cutters and 3d printers) I don't know what additions would need to be made, if any to control Routers or higher axis machines. Can the board be connected via wifi somehow? Ethernet cable isn't going all the way up to my attic! Hi Kester - The cheapest way is probably to use a spare/second hand wifi router to create an ethernet/wifi bridge. If you don't have an old one lying around then a ethernet-wireless bridge can be bought inexpensively. There are many different ethernet to wireless bridges on the market. I have not tried them all but that should do the trick. My Prusa machine has a Sanguinololu board with ATMEGA 8bit controller and Sprinter firmware. At the end of lines and complicated junctions during a print I get "polyps" or "pustules" of PLA pushed out of the side of the print. There are also ridgesat the ends of the chords on circles. This may be due to the controller running out of X,Y steps while data is being processed. Hopefully, the 32bit ARM will be much, much faster and minimise this problem. Can you support this thesis and will ther Duet (and or/firmware) have a cache for buffering steps so as to avoid thes hiccups in xy motion? I have seen the issue you describe before and I am not sure that its caused by the controller running out of XY steps. I have not used Sprinter for a long time but Marlin definitely buffers steps. The problem sounds more like an issue that could be solved by calibration rather than caused by the speed of the electronics. I would look at your retraction settings and run some tests with various simple test objects. I would also recommend moving to a more uptodate firmware such as Marlin. Eki, running from USB definitely can cause problems in some setups. Printing from an SD card is a good idea. That said I have seen these issues even when printing from SD so its not always the fix. Thanks to both for these tips. I notice that the polyps occur at the start or end of a move to a new line (sometimes leaving a whisker). The defects show only with some makes of filament. I will act on your tips as advised. Thanks a lot. PS Apologies for the delay in replying. My desktop PC PSU went US. I definitely would recommend going with a more recent firmware and testing retract settings as the first point of call. Does no delta support mean we can't use this board to build richrap's 3DR (or at least, not yet)? to push this forward. At this stage through RepRap Firmware does not have delta support. Delta printers are now supported in my fork of the firmware, see https://github.com/dc42/RepRapFirmware/tree/dev. where can I find the expansion board ? Hi The expansion boards are in production, we have received the first few and are testing them before putting up a listing. Either the end of this week or early next week. As you will have noticed we are taking longer than expected. I wanted to ensure a complete testing procedure wa inplace and did not get it done by the Christmas break. I anticipate finishing this off over the weekend and listing early next week. Sorry for the delay! Would the used A4982 drivers allow the use of 2,5A Nema 17 stepper motors? Hi, the drivers are rated up to 2A max - to achieve that they would need heatsinking and cooling. So to drive 2.5A through the motors would be too much. That said they could be fine if you dont want to run the motors at their maximum torque. alot of stepper motors are rated to run at 80C when they are drawing max current which is pretty hot! do you have a link to the stepper model - I can giv a better answer then. i'm having compile errors with the duet branch, even after copying the arduino libraries properly into the reprapfirmware folder. it says utility/compiler.h not found or no such directory. ive tried with arduino 1.5.4 and 1.5.5. what have i done wrong? 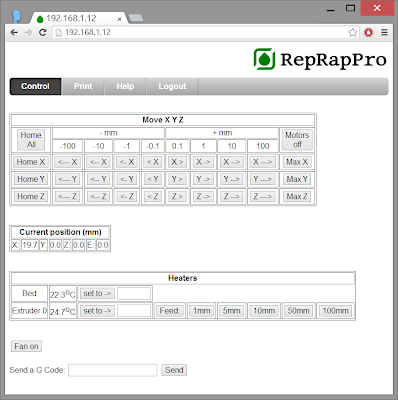 Are you using the RepRapPro version of the RepRap Firmware from their github or the one from the T3P3 github? Is there any ETA for the expansion board? What are the problems with it? No problems at all, we are testing these in house and the first large batch went to a existing pre-order. The plan this weekend is to make a rig to test them quicker so we will have enough to list. I have just published an update to the multi extruder branch of the firmware which now supports 5 extruders. I will keep everyone informed through the blog and twitter (@think3dprint3d) once they are up for sale. Thanks for the patience. I am looking into implementing something like M160 to do what you want. The firmware is working with 5 extruders and I will continue to add features. just finished to desing my 800x600x700mm 3d printer and need to buy a board. 1) can i connect 2 nema 17 in parallel to move the base with heated bed? 2) because of the big heated area i would like to supply the heating system with 230VAC (400W needed): can your board control an SSR? is PID the algorithm you use? Thanks for your answers and compliments for your project! Wow, quite a build area! which motors do you intend to use and how much current do you need to give them to get the torque you need to move that bed? The A4982 is rated to 2A with enough cooling - if you are close to or more than that then you will need a more powerful stepper driver or you could modify the firmware to run each motor of a separate driver to share the load. 2) The bed output can control a relay - I use it that way on a couple of my printers which have high current beds. The firmware currently has the bed set to bang bang but it can be switched to PWM with PID like the hotends (which use PWM and PID). Arduino Due specifies the PWM frequency as 1K but the processor can do a whole rage of frequencies and even two different ones if required although that would require firmware modification as well. With such a big bed I guess it would have quite good thermal mass you you could find that bang bang works ok.
many many thanks for your aswers. I will sure buy the expasion board, avoiding paralle/series and using another output. I'm calculating the torque but i'm quite confident 2 nema 17 with 36.8 N/cm will be enough. For question 2 it's perfect the on-off control. If i'll have time i'll try to update it with PID control. Thanks for your clarification and then i'll go to buy the boards. i saw the stepper but the other i found is 0.9° step. Do i have in your board the 12V necessary to run the motor? Is it possible to connect an external stepper driver to drive a more powerful motor from your board? Sorry to stress you with 100 questions but i have to be sure your board is what i'm looking for. No Stress! So the motor you linked is manufactured by the same manufacturer as the one we sell they are actually very similar the main difference being the one you chose is 0.9 deg per step and ours is 1.8 also the one you linked is slightly higher torque. So you will be able to run those motors but without cooling the drivers won't do the full 2A per phase. Note though that motors will be at 80C with that much current. The Duet will take 12 to 24V input and the stepper drivers limit the current to the motors. For using more powerful stepper drivers the expansion board could easily be replaced to use different drivers. The details would depend on the external drivers required. A number of people are interested in using this to drive CNC or larger printers so it may make sense to do an expansion board to drive the heavy axes and then use the inboard steppers for the lighter axis or extruders. many many thanks again! Now everything is clear. I'll buy the board and expansion. Using zero backslash bearing to move extruder and y axis i should have very low friction. Also i'll have very low mass to move so i'll use the motor i mentioned. Now i know in case of need i can connect bigger drivers and change with bigger motors. Can i fit heat sink and fan in the allegro A4982? No worries. Yes you can fit a heatsink - just ask when you guy the board and we can add some small ones for you to start with. If you need a fan then a cheap 12V fan can be mounted blowing on the drivers but you may find that this is not required. Hi Tony, about more powerful stepper motors, if i understood well the output of duet that control the stepper can be the input to an external driver to control a nema 23 or other motor. Logically the external driver is supplied with an independent power supply. Just for example can i connect the duet output to this one? I have not tried it but looking at the data on the page you linked the fist issue you would need to overcome is that those drivers appear to use 5V logic to drive them, the Duet works on 3.3V logic. Given the amount of power then can handle it might be prudent to isolate them in some way from the duet (eg opt isolator) which could also alow you to change the logic level at the same time. The expansion header has many free pins so if you correctly interfaced them there is no reason why the duet could not drive these instead of the standard expansion board. Hy Tony, can i run my duet with repetier host? I have not tested it with Repetier host but it should work with any program that sends GCode in the standard way. I would like to use for y and z axis two nema 17 in parallel using the duet out (expansion pins?). So if the pibot stepper drivers will work with 3.3V logic then they can be controlled from the Duet - if not then they need a 3.3V-5V logic convertor in between. I am contemplating building a new printer using the CoreXY drive system. That has been ported to Marlin already, are you at some future time going to implement it in your Duet firmware ? The ability to handle a 4 extruder setup like the Kraken is what I want to implement with a CoreXY. Very impressive work ! Well done. Since the work has already been done to implement coreXY in marlin it should be straightforward to port it. That said its going to be some time before I am able to focus on that. The code is all on github so if you want to have a go I would be happy to help where I can. Have there been any further developments on a coreXY implementation? I would be happy to add CoreXY support to the firmware (I recently added delta support), however I don't have a CoreXY printer to test it on. I have been using Arduino Mega 2560 and marlin firmware. Marlin has X_MIN_ENDSTOP_INVERTING = false option. How can I invert my axis in Duet firmware? Is there any G-code, or what is the easiest way to invert axis? Now my axis is moving wrong direction, and also endstops is not working correct. We need to add this feature to the firmware - for now you could try wiring the motor with the coils reversed as a quick fix. Yes, I tried that first, but my home direction goes wrong. I tried to reverse home direction command HOME_DIRECTION 1 -> -1...but it not work? If you look at the more recent versions of the firmware you will see that homing is implemented as a g-code file. This allows you to specify in which direction to go (-200 or +200 for example) and to look for an endstop hit. Then you can say at what point that endstop hit is (for example +190). I need to test it. There is a working firmware for delta printer? Hi, the firmware does not yet support delta printers. Its on the todo list but we have not yet started working on it. There is now, it'a at https://github.com/dc42/RepRapFirmware/tree/dev. Will it have support for a LCD? Every single Stepper needs 2,8 Amps! Is there a way to use your electronics for this? It would be so great! Will there be a further expansion board for Duex4, if yes how many more stepper drivers will be added? I have quad extruder and in future plan to upgrade to 8 extruders ( unconventional design). The XY axis motors have faily under powered drivers (2A) for a Duex 8 setup, would it be possible to upgarde the drivers for higher current ( around 4A) or better if Duex 8 is designed with 2 x 4A drivers instead of 2A drivers. Yes the A4982 drivers are designed for "standard" desktop 3D printers rather than large CNC machines. The point of the expansion boards is that any variation can be designed so if there is a demand for 8x4A axis that could be designed. I have had some enquires for using the duet at the heart of higher power CNC projects so I know people are interested in this. I don't agree that the A4982 are under powered for most 3D printing applications they work really well in these applications and are very well understood and reliable. Hence why we chose them as a start point. Hi Tony, I just received the Duex4 board and I've been wondering what are the exact types of heatsinks I should purchase to cool the drivers. Im not all too experienced with SMD components so all the T numbers got me a little lost. Also, would I need to wire the 12v/24v wire from the power supply to both the daughter board and Duet or just the Duet? Thank you! For the heatsinks these should only be required if you need to increase the current past ~1.2A - we use small aluminium heatsinks that are approximately the size of the top of the chip, held on by double side heatsink tape. We can send you a set if you need. If you are going to the maximum current they would would also need to blog a fan on the heat sinks. I have checked a few places and done some searching but I cannot find anything talking about minimum amps for a 24v supply. I would also like to know the recommended amps if I had all motors/heaters installed and printing at high temps (example: ABS). I would like to avoid buying a second PS when I start adding extruders. Lastly, does this board support the Prusa MK2b at 24 volts? The total power draw will be dominated by the heated bed. The power for your motors and hot end should be similar to 12V so as you are doubling the voltage you should be able to half the current. In reality its not as simple as that ans unless you use a hotend with a higher resistance it will draw double the current while its heating up until PWM kicks in. You can use a 24V heatbed (although i have not bothered as 12V works great) but just be aware once again that you need to work out the current drawn by that resistance with a 24V power supply. In general the max current will be drawn as the heating elements heat up, and that current is normally dominated by the heatbed. The motors are current limiting so you can set them to 1A which is more than enough for a standard Reprap style setup. The hotend and heated bed you can work out from the resistance of the heating elements. then add them all up and add at least 20% to be safe. I'm looking at a 24v 10a 29cm square heater in comparison to the MK2b. My concern would be this current going through the Duet. I've heard stories of boards not handling high current items, but I admit I am not extremely knowledgeable about such things which is why I am asking. I'm also thinking of getting 24v cartidge heaters I guess maybe my question should be what is the limit for running the board (and the extruders/bed) on 24v. Thanks again for your speedy replies. The question is not simple to answer with one number due to where the current flows on the board after it comes in. The Heated bed FET and connector are as close as possible to the V_IN so 10A is fine. For the heaters and motors the current would be lower but there would be no issues if you use a 24V cartridge heater (actually I think 12V cartridge heater would be fine, but you do have an issue with low resistance at 24V, in that it will get very hot very quickly so if the hotend fails with the thermistor falling out then you can get a dangerous situation very quickly). Is it possible to use a two wire Pt100 RTD ? will it require a RTD to digital converter? Is it possible to use a 220V 85W nozzle (Band) heater? I will use a dual extruder with single main motor(NEMA17) to drive two filaments and an auxilary motor (NEMA8) to drive the shifter. Could you please suggest how to code such an arrangement. Thank you Sir. Hi, we have not experimented with RTDs bit it would be possible to use one of the analogue inputs, along with a suitable circuit to measure an RTD. Why do you want to though? To use that sort of heater you would need to use a switched realy or a solid state relay. The actual code implementation you would need to do yourself or adapt from an existing implementation. I want to move to RTD because thermistors do not satisfy my printing speeds for polycarbonate and also they have a consistant long life and future proof. Could you plese elaborate on the suitable circuit for RTD measurement. Thankyou very much for your kind support Sir. That SSr looks ok - you can use the hotend, heatbed or fan mosfets to switch the SSR - the pic any SSR or normal relay that is compatible with the voltages you want to control. I dont have a circuit for an RTD asI have not used them before. Look to see if you can find one and then you will have to test it. If you can find one that works with a 3.3V or 5V uProcessor to read the analogue voltage then that would be a start point. Another option would be to see if you can find an I2C or SPI chip that interfaces with an RTD circuit as the duet has both I2C and SPI interfaces. Thanks a lot for your patient service. There´s just one more question, regarding the firmware "Tool" seems to be a new class that was newly added. There is a limitation on the number of tools that can be defined, exactly how many? I need two for now but in future upgarde to four. Also what are your plans for further expansion of Duex4 and when it might be available? As far as Duex4 is concerned its working really well right now with the Kraken, and already well set to handle up to 5 filaments for colour mixing or swapping so I have no immediate plans to do drastic things with it. If the growing idea of using one hotend and multiple filaments takes off (either mixing or swapping) then a DuexN where N is the number of stepper drivers but there are not equivalent numbers of heaters might make sense. The design in KiCAD is totally open so if anyone spots a good alternative then its possible to make a different Duex (or Duet of course). Hello!Can i adjust on this board 1/32 micro stepps for motors? The Built in stepper drivers go to 1/16 microsteps which I have found to be fine for the Mendel90 Lasercut and other 3D printers. If you particularly wanted to use 1/32 microsteps then you could use an expansion board, similar to the Duex4, but using a 1/32 stepper driver. I'm building a large printer/CNC and I need som big stepper motors in the design, did fint this (powerlolu) board and I wonder if that could be an alternativ together with Duet ? Absolutely we have another customer who has done thus with other stepper drivers. What ypu do is use the expansion header to interface with the bigger stepper drivers. Also we are haveing a sale on the Duet right now! I recently received my Duet and Duex boards, and need to interface some larger steppers for the XY &Z axis, and was considering the Powerlolus mentioned above. Are the step, Direction, and Enable signals broken out to preconfigured pins on the expansion headers on either board?? If so, what pins would I use for each axis?? Sorry, I'm too challenged in the electronics and firmware language to figure it out easily myself. Thank you for any help you can provide!! So for example E4 is 49 for Step, 48 for Direction and 47 for enable. You will see some pins are Xn - these are pins that are not supported by the arduino due libraries and I wrote a separate library to use - if you don't need to recompile the firmware to use different pins then there is no need to worry about these specifically. what is the max voltage the duet can handle? Is 36V still ok or are there some components that limit it to 24V? 24V as manufactured. Some of the components we went to 36 but not universally. that is a bit of a bummer... I'm upgrading a machine that has a PS to 36V, it would be a waste to not re-use it in the new config and it might not go as fast on 24V. Which are the limiting components, the capacitors? As i understood USB i switching between programming/serial mode? maybe it is drivers fault? The Duet and also arduino Due which it is based on have two USB identifiers depending if firmware is loaded or not. Each time you erase the firmware it will come up as one com port. Then when firmware is loaded it comes up as another one. Is this the behaviour you are seeing? It should be one comm post when just the bootloader is present, and another one when firmware is present, so what you are describing does not sound quite right. In Windows 7 & 8 the drivers install automatically - are you using windows or linux? This question was asked months ago, but I have not seen it mentioned since. Has support for Delta configurations been added to the firmware? If not do you know when it will be? I'm in the market for two boards and this board supports all my hardware needs, but I'm not sure where it stands on software. As of now though I cannot give a firm eta on the delta support within the RepRap firmware. Thanks for the quick response. I agree LCD is a must and the BobC port sounds very promising. I'm looking at October to purchase the boards, so I have a little time before I have to commit. I will continue to follow this thread, so could you let us know when a Delta port is available? Also, any thoughts on selling the boards here in the US? With Kraken and other multi head designs, starting to gain popularity, this board it the ideal choice. One more question, what is your thoughts about stacking the two boards, components facing out, with fans on both sides, to cool the drivers, to save space? Any thoughts, concerns? I will certainly let you know - I imagine it will be a whole new blog post! We already sell to the US through our webstore - if you are interested in reselling then please contact us directly through there (www.think3dprint3d.com). The board is designed with a thick copper pour under the heat generating chips on both the top and bottom - well connected with a network of heat transfer vias. That means it does looks heat through the bottom as well as the top. If you have the space then mounting them side by side means you wont need a fan for a standard RepRap style printer with Nema17 steppers. If you want to sandwich them together than having an air gap (10mm? - you would need to test) between the two back sides of the board may be sufficient. Otherwise a fan orienter to draw air across both the front and back of both boards would be most efficient. There is now firmware support both for delta printers and for a colour touch screen control panel. See https://miscsolutions.wordpress.com/2015/01/04/upgrading-the-mini-kossel-to-duet-electronics-part-1-hardware/ and the subsequent posts. I cant see that there are dedicated fan outputs for each extruder. Are they there? There is one PWM fan output (on the main Duet) but not on the Duex4. I made the decision to send the few remaining pwm lines to the Duex4 expansion header (so you could control fans from there using a simple circuit). I am less familiar with using PWM for DC fans. Can you let me know if I should be thinking of a 5 volt or 12 volt DC fan? Also How can I find out more about how you are using the PWM, for instance can a Signal (tach) input from a fan be used to give feedback on fan speed or potential fan error messages? I recommend using a 12V fan (such as you would from the existing FAN0 port on the duet, and then use an external mosfet to contorol the 12V. I have a question about USB. My printer works only with RepetierHost and with turned on option "RepRap Duet"
When i send G code manually it doesnt work well.. The main question is: what is the difference? I don't use Repetier host so I don't know how they format their g-code differently in manual mode. Thats weird though. With Pronterface in "just works". Is it possible to use HSMCI as SPI? Well the HSMCI interface is hardwired to the SD card slot and the SPI bus goes to the expansion header - what were you wanting to do? 2) why to use native usb from due? it is buggy AS HELLL!!! Put something like FTDI chip! and it has such big disadvantages! I will certainly look at the ground pins - what do you need them for? HSMCI allows you to use SD 2.0 compliant cards so while you do not need the size or speed right now it is more compatible for the long term. Also it leaves the SPI interface free for other things! As for the native usb I have not had any issues with it - what bugs are you seeing? All the Ormerod users have not noticed issues with the native USB port. Of course the UART lines are still there so if you want to use an FDTI-Serial board then thats open to you. How to use HSMI library in SPI mode? error No SPI interface is defined for SD MMC stack. SD_MMC_SPI_MEM_CNT must be added in board.h file. HSMCI is the same as SPI, but in 4-bit mode? So the commands are the same for SD? SD_HSMCI library uses DMA to access SD card? So i will try and answer your questions all in this reply. HSMCI in SPI Mode: I never tested the library in SPI mode as the Duet is physically set up with the SD card slot connected to the HSMCI bus. The SPI bus is broken out to the expansion header. Is HSMCI the same as SPI - not as far as I know they are different protocols, although they might be similar. shows how it is used. Both Marlin and Repetier support Delta printers and have been ported to the Due, so it should be possible to get either one of these working on the Duet by editing the pins.h and configuration.h files. Yes BobC has ported Marlin to the Due and adding the additional pins from the samnondue library, would allow marlin or Repetier to work on the duet. As Ilja says if you want to use the built in SD card then the HSMCI library would need to be used however the SPI bus is available so a standard LCD+SD would work with the pin definitions updated. The reason I would rather port Delta and CoreXY to RepRapFirmware is that this is built from the ground up to make use of the additional features, especially the ethernet (and thus wifi), that the duet has. The ability to control the printer from a web browser is really sweet and makes any tablet or smart phone a controller. the heat bed out is at 12v or 24v? or it's depends the power supply connected? I would like E0 to work like Y axis ( for shapeoko like), could you please suggest me the code for this change. I am not familiar with the shapeoko - I presume you want the output from E0 to drive a second Y stepper driver in tandem with the existing Y axis? If that is the case then you can look though the Move.cpp to find the Y movement routines and modify them to also drive the E0 stepper. For safety it would be a good idea to prevent the normal E codes from assigning E0 as an extruder. I would probably do this by increasing AXIS to 4 but would need to look through the code and do some experiments to confirm. and so on for the heaters as well. So don't change the arrays in platform.h. The functions in platform.cpp that you have identified may need to change. you will need to work through and understand the difference between a "drive" which can be X,Y,Z,E0,E1 etc and an "axis" which is drives that are not to be used on tools. So if you have a look you will see that this actually send the step signals to the individual stepper drivers. In this case you want to capture when the "drive" is equal to Y_AXIS and then step Y_AXIS and E0_DRIVE. You need to capture the enable and direction changes as well. The "digitalWrite()" and "digitalWriteNonDue()" sepend on if the pin is an arduino Due pin or not, so you need to follow the pattern set so Y_AXIS is a normal arduino pin or Step, Direction and Enable. while E0_DRIVE is not a normal arduino pin for Step, Direction or Enable. Don't forget to look at all the functions such as Disable, Set direction, etc to capture each point you want to act on a Y axis move by stepping Y_AXIS and E0_DRIVE. You also need to think about how you setup tools to ensure E0 is never used in a tool. Since E0 has nonDue pins, how about this array [Y1,Y0,Z,E01,E1,E2,E3,X]. So as to put the expansion board on the X axis mount to simplify the wiring. I need to mirror the Y axis either to E4 or to X and swap it with E4. Please suggest. P.S : Sorry the array I meant was [Y1,Y0,Z,E0,E1,E2,E3,X], typing error! If you ensure you change all the relevant arrays ( enable, direction and step) then swapping which pins drive which motors will work (ie moving the X axis to the expansion board). For the Y0, Y1 modifications you need to ensure that when Y is stepped both Y1 and Y0 are stepped at the same time (ie set Y0 and Y1 high, then set them low again, not step Y1, then Y0). Does the Duet support servos for autolevelling? If the servo control input works with 3.3V then yes. There are not specifc pins allocated to this within firmware or on the expansion header however. Also be careful that the servo power voltage (probably higher than 3.3V) is isolated from the control pin . Hi Tony, the servo is a Tower Pro SG90 and uses 3.3 volts for the control pin and 5 volts for the motor. So I guess we're going to be ok. If I order one will the board come with info as to where I can connect the servo? If not then it's a question I can ask at the time of setting up. As far as I can tell you can use any of the spare digital IO pins on the expansion header for the control signal, and there is a 5V pin on that header as well. The potential issue is that servo support is not built into RepRap firmware so you would need to add that functionality. I tried to watch pins RX0 TX0 etc but theres nothing there! Also i tried ASCII table the same result.. I imagine the issue is with repetier firmware not being setup to wirk with the other UART ports. The hardware does work because I have used Serial1.Print () in arduino as a debug method. Is it possible to use thermocouple I stead of thermistors? There is no thermocouple circuitry built into the Duet however there anr many digital and analogue inputs on the expansion header, along with SPI, so you could use an external thermocouple board and add support of that to the firmware. have you a direct need for a thermocouple? - we find thermistors pretty versatile. To use a thermocouple, you would need to use a thermocouple amplifier board. These come in two forms: ones with digital output and typically based around the MAX31855 chip, and ones with analog output typically based around the AD595 or AD8495 chip. You can get these from Adafruit, Sparkfun and eBay. Then the firmware would need to be changed to support the board. Supporting the analog sort would be easiest. I can probably find time to do this. But you only need a thermocouple if you want to extrude at higher temperatures than for ABS. Can you tell me if the new firmware for Duet is supported by the Windows 8.1 3DP API? Hey. Unlike Marlin you do not need to recompile the firmware for every change in configuration. Most changes can be set using Gcode in the /sys/ directory on the SD card. Check to see if they are supported y the RepRapFirmware. If you look at the /sys/config.g file you can see some examples of how to set various parameters that you may have set in MArlin using configuration.h previously. thanks for the reply Tony, i purchased my boards on 1/19/2015 and the wiring in the wiki is outdated, can you direct me to a correct wiring of the board please. on the main board where i am to connect heater and thermistor for the hotend i am reading +12v across the one thermistor and the hotend circuits and i shouldnt get 12v on the thermistor circuit correct. thanks for your help. scroll down to "Modifying the Duet and DueX4 (optional)"
If you are using just 2 extruders, then instead of modifying the Duet and DuetX4 to get rid of the noise on the second thermistor, it is simpler just to swap the heated bed and hot end #2 thermistors. The firmware has a configuration option to remap thermistor channels in the M305 command. Best forum for help with the Duet is probably http://forums.reprap.org/list.php?340 because more Duets are currently used in Ormerods than anywhere else. Have you set up the files in the /sys folder of the SD card, in particular config.g and the homing files? I download the latest version of Duet KiCAD files, however, my KiCAD doesn't show the schematic component, instead a question mark is shown. Where should configure the library search path so that all components will appear? All the non standard libraries that the project uses are within FE.lib which is in the same directory as the other KiCAD files. Did you download the whole project as a zip file? Is duet compatible with usb host? like arduino due? I'm thinking maybe i can send some pictures took with a webcam. After the V0.6 we removed the USB OTG capability from the Duet (it is not present on the 0.8.5). There really is not enough spare processing power to do video capture/compression and we decided that the other uses for USB host were outweighed by the effort to implement them. If you can get hold of a 0.6 that has the OTG hardware then you could implement some form of picture to the firmware but I feel it would be easier to use an external webcam on the same network as the Duet.